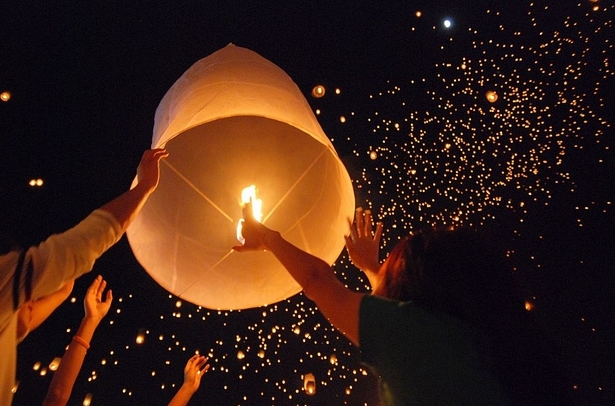 There have been a number of questions regarding the popular Aerial Luminary, or "Sky Lanterns" as they are called. Sorry, the answer is no. You can not have Sky Lanterns at your wedding in Hawaii. House Bill 2113 imposes a total ban on the items, including the ignition, possession, sale or use. Over the past year, fire departments reported an increase in use of sky lanterns, which are paper lanterns with an open flame. A small candle inside heats the air in the lantern, causing it to rise for several hundred feet and remain airborne until the heat expires. The lanterns, authorities say, can remain airborne for over four minutes, and pose a potential hazard by interfering with aircraft, flying into power lines, landing on roof tops, and landing in combustible vegetation posing a brush fire risk. According to authorities, sky lanterns can reach an estimated altitude of 400-500 feet, a height of which local air traffic may fly in certain areas of the State as permitted by the FAA. Depending on wind speed and direction, official say the lanterns also have the ability to travel an estimated lateral distance of up to 1150 feet. FAQ: What is an energy surcharge?